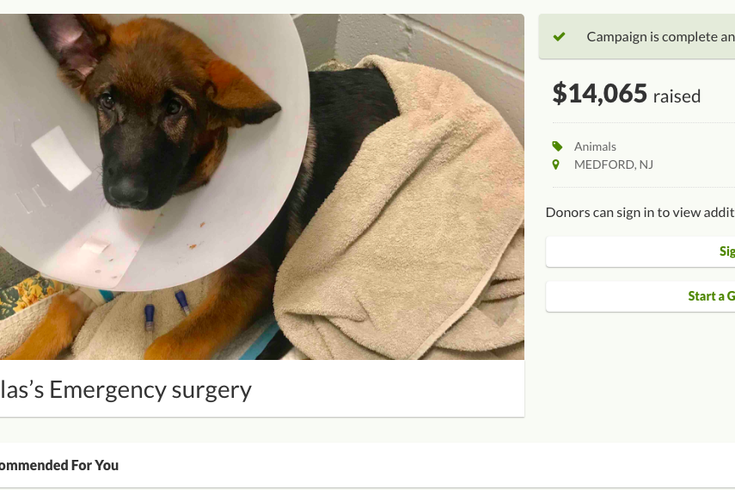 This screenshot shows the GoFundMe fundraiser page for Atlas, a German shepherd who died in the care of Reid M. Herjo, according to Medford police. Herjo allegedly abused the dog and set up the campaign with a fake story about how Atlas was injured to raise money for the puppy's vet bills. A New Jersey man is accused of beating his dog, lying about it and then starting an online fundraiser to pay for the pup's medical expenses. On Tuesday, Medford police announced Reid M. Herjo has been charged with animal cruelty and theft by deception. Herjo, 24, of Shamong, was stopped by police for speeding on Jan. 22. He told officers he was taking his 14-week-old German shepherd, Atlas, to the veterinary hospital because the dog had been struck by an ATV. Five days later, authorities received a tip suggesting Herjo was lying about how his dog sustained the injuries, police said. A joint investigation with New Jersey State Police revealed Herjo allegedly intentionally caused the "severe" injuries to his dog, which included numerous fractures and hemorrhaging, police said. On two separate occasions, Atlas sustained injuries during the six weeks he was under Herjo's care, according to authorities. Herjo reported that the injuries came from the dog falling down the stairs and falling down a hill, police said. Still in Herjo's care, Atlas died under "suspicious circumstances" on Feb. 3, police said, with evidence suggesting the dog had suffered additional trauma. Besides the alleged animal abuse, Herjo also is accused of setting up a GoFundMe page to pay for Atlas' veterinary bills, using a fake story about how the dog was injured in a hit-and-run crash. The campaign raised $14,065 with 693 separate donations over a 28-day period, police said. A GoFundMe spokesperson told PhillyVoice that misuse of the company's platform is uncommon, but added that there are a few instances where "people create campaigns with the intention to take advantage of others' generosity. " All users who donated to the campaign will be refunded and Herjo has been banned from the platform, the company said. "It's important to remember that our platform is backed by the GoFundMe Guarantee, which means that in the rare case that GoFundMe, law enforcement or a user finds campaigns are misused, donors are fully protected and will get their money back," GoFundMe said in a statement. "Additionally, we are working with law enforcement on their investigation." Herjo was formally charged on March 28. A Burlington County Superior Court hearing is pending.